Any new parent will be able to tell you this – there is no baby out there who does not enjoy a little rattle once in a while, and when it comes to keeping a baby settled and cooing away instead of bawling his or her lungs out, a rattle would be able to do the trick, although a pacifier, too, does come in handy at times. With the $7.99 Spraypaint Can Baby Rattle, you might be seen by some to subtly introduce elements of the subversive, considering how a spraypaint can is more often than not used by vandals. 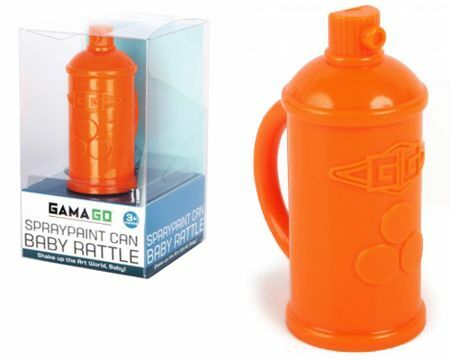 The Spraypaint Can Baby Rattle is BPA-free and dishwasher safe, which means you will be able to let baby enjoy it and even bite all over it if he or she feels like it. Good thing there are no poisonous or harmful chemicals inside, making this rattle safe as safe can be.